When I arrive at my chosen lake I like to set up my carp rods as quickly as possible. Some carp anglers tackle this by leaving their rods set up in a rod bag. But, how do they know what type of rig set up they're going to need for the peg they decide to fish in? Instead, I prefer to set up my carp rods to suit the fishing situation. This way I can assess the area and analyze the topography of the lake bed before setting up any rod. With the information of the peg I can create a specific carp rig suited to that situation. This system is a fast way to link all terminal tackle end components quickly to my mainline so that I can cast out my carp rods as quickly as possible. On this first page I reveal all my the leadcore quick change set ups. I use a pouch (shown below) full of ready-tied leadcore leaders which can be quickly tied onto my mainline. My quick change pouch system is full of different types of leadcore terminal tackle components from inline ledger rigs to semi-fixed lead rigs, and includes different variations of lead set ups, as well as various colours of leadcare leaders. This gives me plenty of flexibility to suit any lake or carp fishing situation. How to set up rods quickly by using my quick change leadcore leader system. 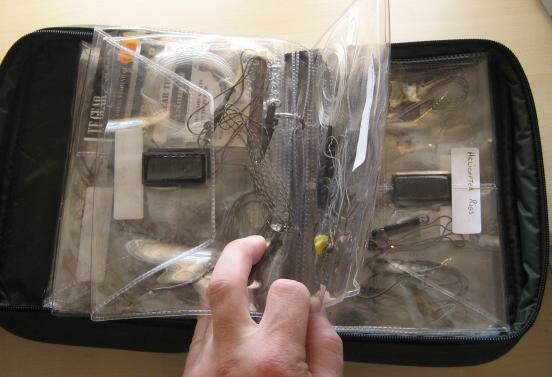 Here is the pouch which shows how I organize my terminal tackle set ups. Each variation of set up is placed into its own clear pocket within the pouch and labelled so they can be located very quickly. Want An Inline Lead Quick-Change Leadcore System? Shown above is the pouch that holds the leadcores with lead clips already pre-tied. It also holds 3 different colours of leadcore; Weed green, Black silt and Black & white fleck. 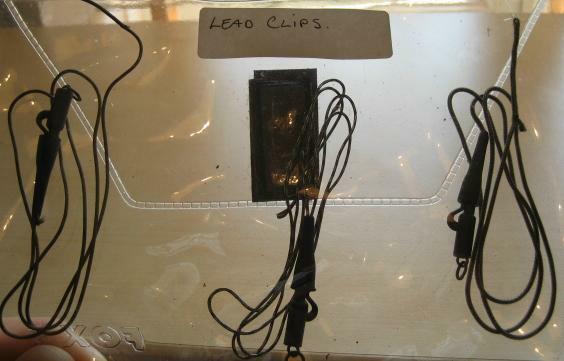 Click here to see details of the lead clip leader set up. I have also developed a way to quickly change my hook links! Shown above is the pouch that holds the pre-tied helicopter components. These may have slight variations to normal helicopter rigs because I often try out new ideas and experiment by adding, or changing different bits. 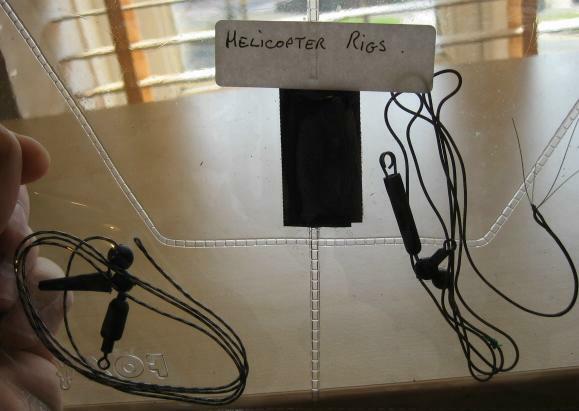 Click here to see details of the Helicopter rig set up. Shown above is the pouch for all my leadcore running rig components. Again, I like to hold various colours to suit the bottom of the lake bed. 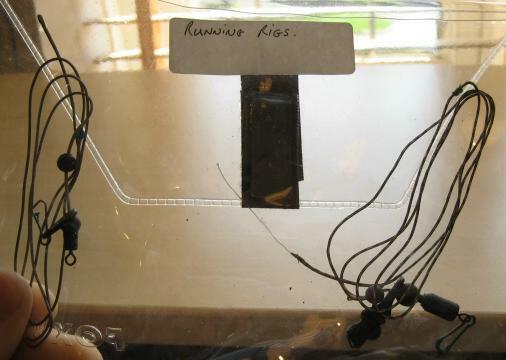 Click here to see details of running rig set ups. The picture above shows another pouch for my semi-fixed rig ends pre-tied at home. I don't use many semi-fixed rigs when carp fishing but, I feel in more control if I have plenty of choices when fishing for carp. 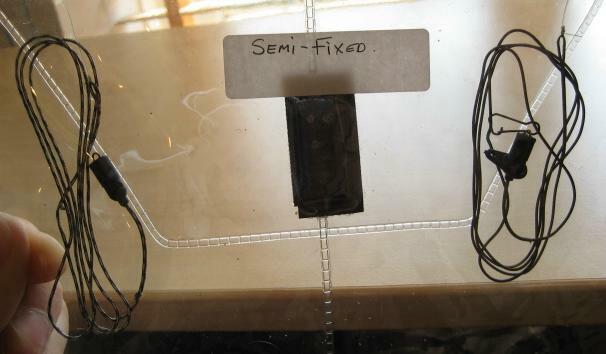 Click here to see details of the Semi-fixed rigs. I also have quick change inline leadcore leaders. They are interchangeable between inline leads, methods, stones or lead clips. Due to the number of photos needed to reveal how this system works I have placed these on another page to illustrate the quick change system set up. Look At Our Fast Changing Inline Lead core Leaders Shown Here.